Perfect cleaning with just water? 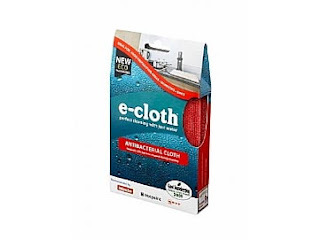 E-cloth claims water is all you need to use with their range of cleaning products. Sound too good to be true? Well I recently had the opportunity to find out when I was offered the chance to review the e-cloth Anti-bacterial cloth. Let’s find out more about e-cloth. 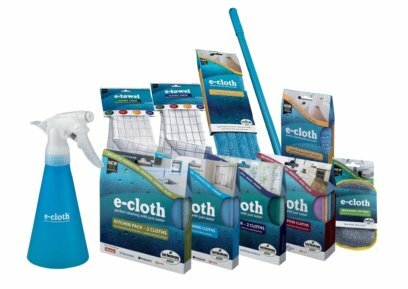 Discover a new way of cleaning with the award winning e-cloth, a revolutionary cleaning system that can save you both time and money. The e-cloth range of cloths and mops are designed to clean all hard surfaces around your home with just water! The secret to e-cloth’s highly effective cleaning performance is the millions of tiny clever fibres in each cloth, which clean by breaking up, trapping and absorbing grease, dirt and bacteria. As a result e-cloths are far more effective at wiping away bacteria from hard surfaces than other cleaning products. E-cloths are also chemical free and won’t leave any nasty chemical residue behind, leaving surfaces cleaner for longer with perfect results every time. Ideal for the kitchen and bathroom, the antibacterial e-cloth will clean all hard surfaces, including thick grease. The cloth incorporates natural nano-silver to kill bacteria caught in the cloth. The thicker fibres and their wedge-shape construction give the cloth its extraordinary cleaning power. They also give the cloth high and rapid absorbency. Mum has been using the antibacterial cloth in the kitchen for a few weeks now, and she is really impressed with it. The e-cloth can remove tough, ground in grease and dirt really effectively with just water. When Mum first tried it she got all excited about how good it was (I think Dad thought she had gone mad for getting excited over a cleaning product!). The cloth is quite thick and really absorbent so it easily wipes up spills, and is great for wiping down surfaces after preparing food. The antibacterial e-cloth is washable and can be used over and over again. We’ve washed it a few times now, and it still works as well as when we took it out of the packet. All products in the e-cloth range are guaranteed for 300 washes and, as well as being environmentally friendly, are designed to save you both time and money. The RRP of the antibacterial e-cloth is £4.99 which I think is a great price. Think of all the money you can save by not having to use sprays and cleaners, and the saving of not having to constantly replace disposable cloths. As e-cloth eliminates the need for chemical cleaning products, it can help reduce your household cleaning bill by up to £100 a year while ensuring your green conscious remains clear! Not having to use so many chemical-filled sprays and creams has got to be good for the environment, which is another big plus of this product. It is also good if you have got children or pets, as they can accidently ingest dangerous chemicals from cleaning fluids. The e-cloth is great quality, and feels like it will last forever. This is a fantastic product which both Mum and I were impressed with. We are planning to purchase other products in the range, so we can stop using chemical sprays in other areas of the house.